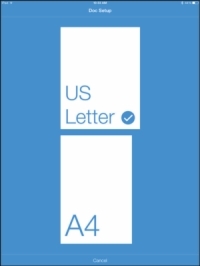 1Open a Pages document and tap Tools. 2Tap the Document Setup option. You see a blueprint-like section that’s markedly different from the view you see when you edit an individual page. 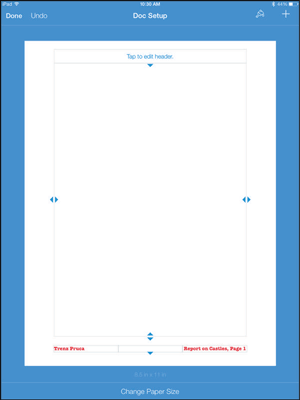 Note that this page will not rotate when you turn your iPad, it displays in portrait orientation only. 3Tap a header or footer to customize it. You can use the three footer sections to insert the author’s name, a title, the version number, or the page number, for example. Type some text. 4To add page numbers to your document, tap in the header or footer section that you want to use for the page number; then tap the Page Numbers button in the contextual menu that appears. This contextual menu is displayed only when you tap a header or footer. You can choose the format of the page numbers. 5Tap the style you prefer. Consider choosing a style that matches your document theme. 6Set the outer limits of the area for the page content (as well as for header and footer) by dragging the lines. These settings determine the printable area of your document on the page. Margins that you set using the ruler define this area. 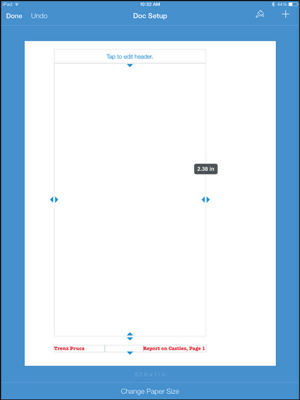 7Tap the Change Paper Size button on the bottom of the page and select a predefined paper size. Tap US Letter to print on 8 1/2 -x-11-inch paper or A4 to print on standard international letter paper. 8Tap Cancel if you decide not to change the page size and then Done to return to your document. After your page is set up, you’re ready to finish entering text in your document and print it when it’s done.